On Sunday, 6th November, 2016 a total of 27 Legion members took part in the fall work party to ensure that the Branch was up to snuff for the Remembrance Day Parade and Service. Members of the work party split up into groups and did various tasks around the branch including sweeping the parking lot, checking and weeding plants around the property. Another group did cleaning and painting tasks inside the building on both floors of the Branch 36. After the work was done, everyone enjoyed a delicious meal brought in by fellow comrade Peter Martin and prepared by Marie Kobylinski. It should be noted that Leo Shaidle could not come on the Fall Work Party date but instead did work in the gardens around Branch 36 earlier in the week. 1. The well organized work party gets to work so that no-one is overworked. 2. The crew members really went to town cleaning up the parking lot and Peel Street entrance. 3. Cleaning up tree parts in the parking lot. 4. Blowing leaves out of the Horseshoe pits. 5. The horseshoe pit area also had to be cleaned up. 6. There was lots to do in the parking lot. 7. Janice Mancini weeds while Fred Haddock gets the weeds into the wagon. 8. 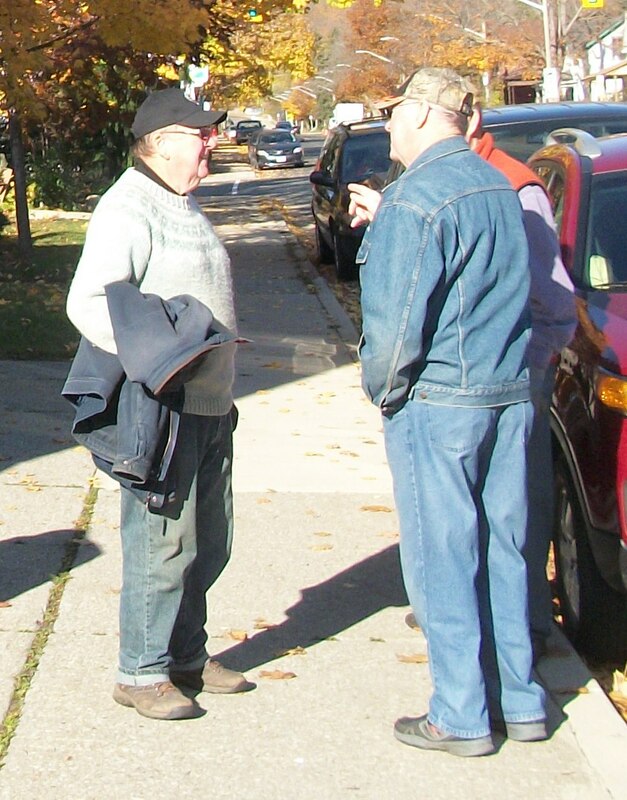 Dave Steele and Fred Haddock look at the work that has to be done. 9. Fred Haddock and Janice Mancini happy that the weeding is all done. 10. Jack Murnaghan and Fred Haddock take a short rest. 11. 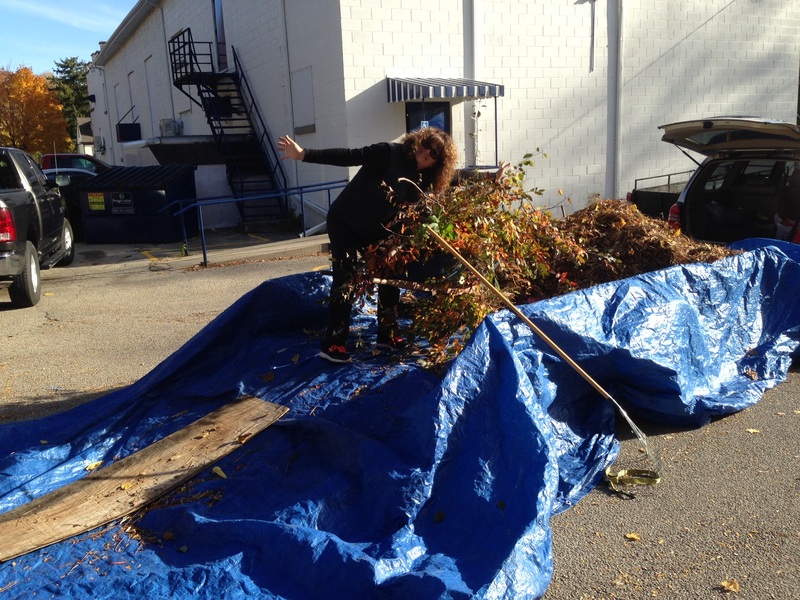 Janice Mancini gets weeds and leaves into truck. 12. Pat Dumayne, Greg Sherring and Jim Sherring finish relocating the smoking tent. 13. Greg Sherring gets his tools together to start on cleaning up the parking lot. 14. 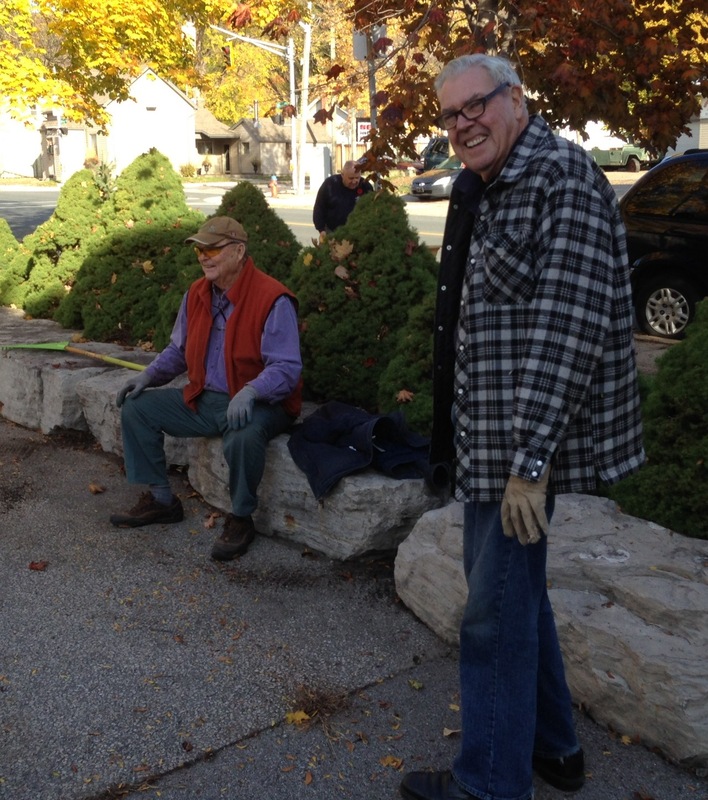 Helmutt Schiller and Doug Harvey work on cleaning up the rear parking lot. 15. 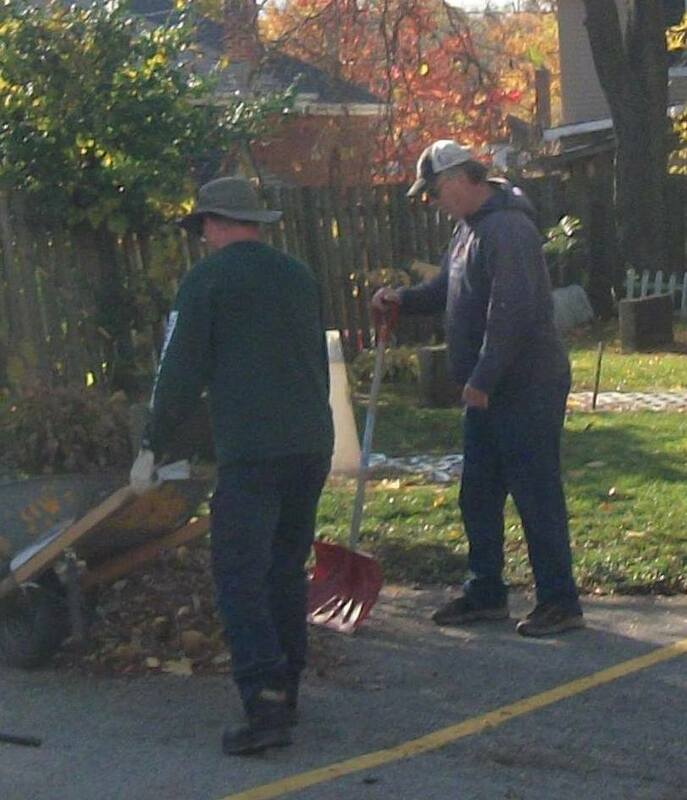 Pat Dumayne and Jim Sherring get the garbage cleaned up. 16. Paul Penney, Jim Sherring and Pat Dumayne getting their tasks done. 17. Greg Sherring listens to some advice about leaves. 18. Greg Sherring gets the leaves together his way. 19. Bill Leckie and Gord Sharpe having a discussion. 20. Stan Hicks and Brian Holme inspect a new flag. 21. Stan Hicks and Brian Holme install a new flag. 22. Stan Hicks and Brian Holme finish installing a new Union Jack Flag. 23. 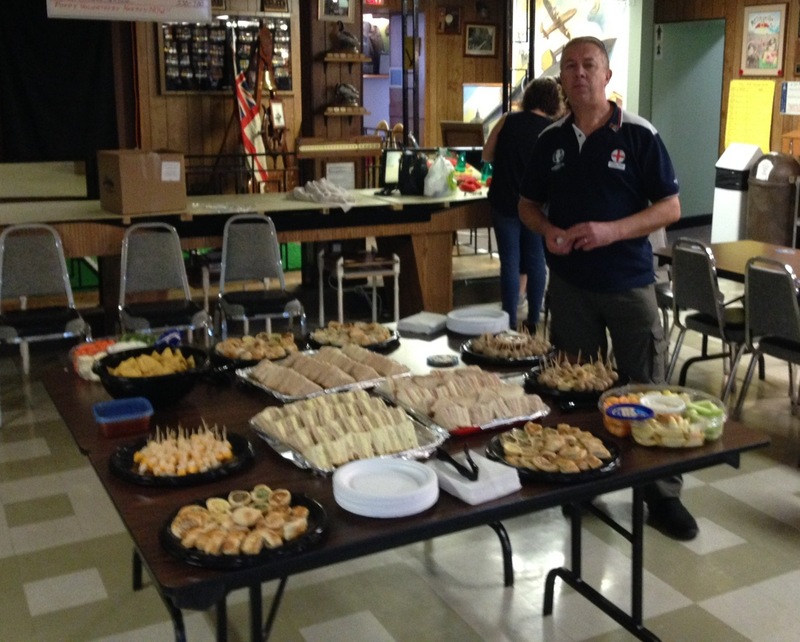 Mike Alkerton does some clean up in the Banquet Hall kitchen. 24. Doug Rivers applies a touch of paint. 25. Linda Rivers straightens some chairs. 26. Caitlin Robinson takes a break from cleaning. 28. 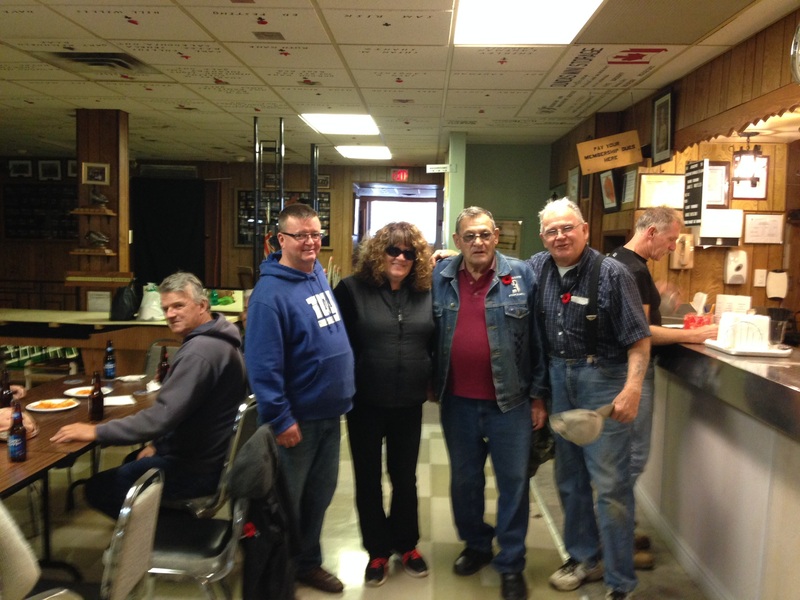 Brian Holme, Janice Mancini, Stan Hicks and Paul Penney relax after the Work Pary was completed. 29. Paul Martin makes sure the Luncheon is ready for the Work Party - Marie Kobolynsky(not in picture) also worked on the meal. 30. 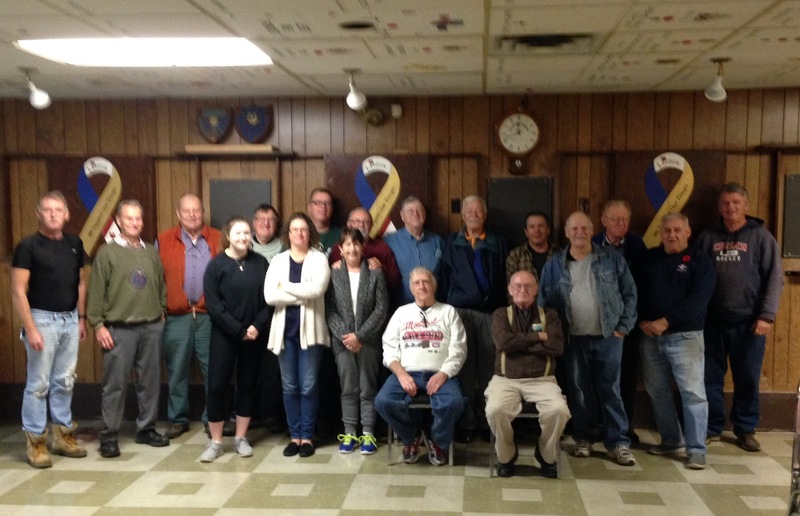 Group picture of the volunteers who attended the 2016 Fall Work Party: Greg Sherring, Geoff Hodgson, Jack Murnaghan, Caitlin Robinson, Bill Leckie, Leanne Robinson, Dave Hawthorne, Linda Rivers, Doug Rivers, Gord Sharpe, Mike Alkerton(seated), Hugh Graham, Jim Sherring(seated), Pat Dumayne, Doug Harvey, Helmut Schiller, Dave Steele.